The Parish of Ampney Crucis is one of five parishes (& seven churches) within a benefice served by the South Cotswold Team Ministry (click here for their web site). The other parishes are Ampney St Peter & St Mary, Down Ampney, Poulton, and Driffield with Harnhill. The parish lies within the Fairford Deanery and within the Diocese of Gloucester. The church is dedicated to the Holy Rood, an ancient term for the Holy Cross. The activities of the church in the parish take place under the guidance and decision of the Parochial Church Council, normally chaired by the Vicar, and consisting of the Churchwardens, a Secretary, a Treasurer and several regular members. Meetings of the Council are private. The Council has an Annual General Meeting open to the public in April each year. The parish maintains an electoral roll, membership of which qualifies parishioners to vote at the AGM. The dedication of this church to the Holy Rood (Holy Cross) is rare and ancient. At the time of the Doomsday Survey in the year 1086, the village was already known as Holy Rood Omenie (Ampney), the name Ampney being taken from the name of the brook. The cross in the churchyard, which dates from about 1415, reflects the dedication of the church. There are detailed drawings of the four faces of this cross inside the church. The condition of the carvings of the cross is good, mainly because the top of the cross was saved from damage by the iconoclasts of the seventeenth century by being walled up inside the Rood Loft staircase. It was re-discovered there in 1840 and re-installed on the pedestal in about 1860. There is the remnant of a possibly earlier cross, without its top, at the end of Church Walk – opposite the church gate. Inside the church is a list of the Rectors of Ampney Crucis from the year 1304. Nearby there is also a plan of the church showing the period of construction of the various parts of the church. Immediately opposite the porch door, which itself dates from the early fourteenth century, is a Saxon doorway, now blocked up and with a threshold about two feet above the floor of the current church. Perhaps this doorway is the remnant of an earlier church, which stood at that level though this is not actually known. This north wall of the church also has a splayed Norman window and the remnant of another one to the east. The other Norman features of the church are the fine chancel arch, with its chevron design, and the font under the tower arch. The rest of the building has been added at various periods. The North transept, the crossing of the nave, the doorway inside the porch and the chancel are largely from the Early English period; several of the windows and the tower are of the later Decorated and Perpendicular periods. On the east wall of the tower can be seen the line of an earlier roof – the existing one is probably fifteenth century. As with many Cotswold churches, each gable has a carved stone cross at the apex. In the south wall of the chancel is an old priest's door, now no longer used. There are a number of interesting detailed features, both outside and inside the church. On the right side of the porch entrance is an old scratch dial, used to indicate the times when Mass would have been said. On the south side of the church tower is the trace of an old sundial. The tower has a peel of six bells. One of these is pre-Reformation and has on it in Latin the lovely words 'Pure Gracious Virgin take into Thy care all those who I may call together here'. There is a late Norman pillar piscina in the chancel and another piscina in the wall of the North transept, indicating that this transept was once a chapel. The carved door behind the fifteenth century pulpit used to lead to a rood loft in the chancel arch, probably removed at the Reformation. 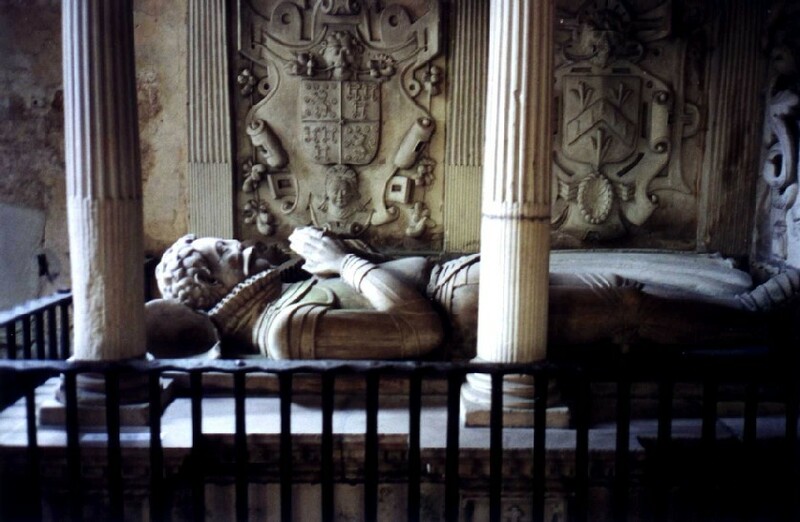 In the North transept is the beautiful tomb of George Lloyde, who died in 1584, and his wife. They lived at Ampney Park. The estate was sold to the Pleydell family. There are four memorial tablets to the Pleydell family in the South transept and two in the vestry. Also in the vestry is the memorial stone to Viscount Downe, a member of the family, who was a professional soldier, served at the court of George II and was killed at the battle of Kampen in 1760. In the seventeenth century, the Pleydell family founded the educational trust named after them, which still provides substantial support to the village school and students from the village. Subsequent owners of Ampney Park included the Blackwell family, to whom there are several memorial tablets near the high altar, and the Cripps family which helped to renovate the church in the early twentieth century. The beautiful windows on the South side of the chancel, made by the noted firm of Heaton, Butler and Bayne, are a memorial to a member of the Cripps family. In the Middle Ages, the church walls were largely covered in paintings. Some of these remain, especially in the North transept. In the nineteenth century, before the nave paintings were lost, the signature of a painter was to be seen by a figure of St Christopher on the North wall - Thomas, ye paintere of Malmseburie - the only known signed wall painting in England. There are remnants of the paintings on the timbers of the nave roof and in the South transept. The figures in the North transept include St Helena, St Paul (with a sword), St James the Great, an Archbishop, a Bishop and the remnants of a painting of St Edward the Confessor, only elsewhere depicted in a parish church at Faversham in Kent. There are also numerous fleurs de lys and other decorative forms. Further restoration of these paintings is planned when funds are available. The churchyard includes a number of old tombs, and is the burial site of two Royalist soldiers killed during the Civil War. thy going out make joyful with His Grace. The church maintains a Book of Remembrance containing the names of those whose ashes have been interred in the Churchyard. The North Transept of the church has remnants of medieval wall paintings which English Heritage is keen to conserve. A programme of work began in 1997 with this end in view. The paintings were stabilized where the plaster was coming away from the wall and damp penetration from the roof was addressed. As soon as the church roof has been repaired or in parts replaced, the condition of the paintings will be re-analyzed and the moisture content of the walls monitored for one year. Ground level drainage will then be improved and a programme worked up for subsequent conservation work and installation of lighting to permit better viewing of these paintings. There is a peal of six bells, which are regularly rung by a team of local bell ringers. The tenor bell is of pre-Reformation manufacture (prior to 1537), the other five date from 1620, 1630, 1660, 1780 and one of unknown age.